Science can get sordid sometimes. I should have enrolled in zoology instead of physics because, as I've found out during the course of my studies, studying animal copulation is way more interesting than studying particles you can't actually observe with the naked eye. Okay, let's get into serious business now. What is the relationship between sperm swimming speed with promiscuity? 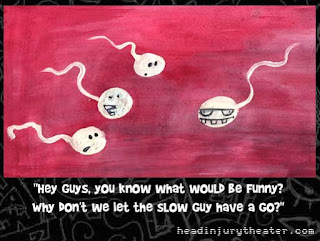 We all know that sperms are mini tadpoles on steroid. 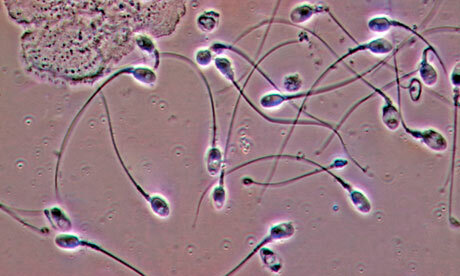 Out of billions of sperms only one can fertilize the egg. And within the acidic canal of the Fallopian tube many more will die, so there's no room for your little demons to sit back and chill. A team of researchers at the University of California, Irvine, and the University of San Diego uses specialized lasers to trap (not kill) sperms in order to calculate the force exerted by these little swimmers when they swim. Stronger sperms swim faster because they exert more force, and thus are able to swim past traps set up using weaker laser power. Using this technique, the researchers tested the swimming speed of chimpanzee sperms, rhesus monkey sperms, human sperms and gorilla sperms. Anyway I can't help but wonder how did they acquire the gorilla sperms. According to the report in Scientific America, the chimps and rhesus monkey were tricked using artificial vaginas, and the gorillas were given candies with "the helping hand of a researcher". Note to self: never complain about job again. Human sperms clocked in at 0.2 km/hour, while chimp and rhesus monkey sperms went up to 0.7 km/hour. But the gorilla sperms could only swim at 0.1 km/hour. 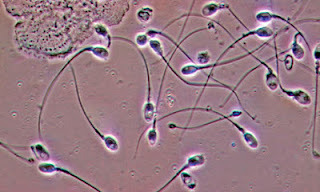 In terms of energy, the smaller primate sperms did it at 50 piconewtons, compared to 5 piconewtons in human sperms, and 2 piconewtons in gorilla sperm. So it's clear that we are not far ahead of the monogamous gorillas. But the fact that we are only slightly ahead suggests that humans probably had a more promiscuous past. Of course there are a myriad of factors that could slow down human sperms;-a more relaxing lifestyle, smoking, and plenty of mate to choose from as the human population explodes. So humans might still be promiscuous (it is estimated that roughly 30~60% of married individuals in the United States will engage in infidelity at some point during their marriage), only with slower sperms. Just saying.